Planning an adventure to Italy? Make sure that you check out this Italian gem! In the Northeastern corner of Italy, Trieste has been a part of Italy since 1866, and thrives as a unique city in the region of Friuli. Friulianis have survived a difficult history of invasions by Romans, Huns, Goths, Lombards, Nazis, and lived through Austrian rule for centuries. As a result, Trieste is a crossover city that beautifully blends the Venetian, Austro-Hungarian, and Venetian cultures together while celebrating the differences and authentic traditions. Located just a few miles away from Slovenia, and about 10 miles from the border of Croatia, it’s not uncommon to hear locals speaking Italian, Slovenian, and Croatian. You see this blend of cultures on the local menus as well, where the selection ranges from Italian pasta, gelato, Hungarian goulash, wurst, to Viennese pastries. Trieste is Italy with a twist! We stayed at the historic Grand Hotel Duchi d’Aosta an elegant hotel directly on the Piazza d’Italia, the best location in Trieste. The Duchi is a stylish hotel decorated in antiques with old world charm and modern ammenities, and even has a thermarium spa! The staff is warm and friendly but also professional and responsive. Harry’s Bar serves an amazing buffet breakfast, presented with local breads hot out of the oven, and always paired with a morning prosecco and Illy’s famous coffee. In the evening you can sit on the terrace and enjoy a cool drink while watching the piazza buzz with groups of families and friends chatting about their day, while children play nearby. Our suite was comfortable and decorated with eclectic wood furnishings. The suite next door was dedicated to Cassanova, giving the hallways an air of romance and mystery. What to do in Trieste Italy! World class shopping and grand cafes surround the Duchi’s prime location. One afternoon, we strolled through the pedastrian streets along the Canal Grande and walked towards the Piazza Sant’Antonio, then shopped along via Dante Alighieri, via San Niccolo, then back to Piazza Unita D’Italia, through Piazza della Borsa. Further away from the town center, you can walk along the Adriatic boardwalk leading to the Miramare Castle that stands alone on the far end of Trieste. Ristorante Al Bagato is a stone’s throw from the Duchi. Global Adventuress recently provided a detailed post on this exceptional restuarant here, with the freshest fish you will ever experience. Highly recommend dining at this gem, but book early as seating is limited to 26 people. A highlight during our stay in Trieste was touring the Zidarich winery , located nearby in the Italian Karst. Benjamin Zidarich is a passionate and innovative wine maker whose family home is in the middle of the magnificent vineyard that overlooks the gulf of Trieste. Benjamin took us through the vines, ripe with healthy and tasty grapes ready for harvest. The Zidarich wine cellar is a spectacular cave that spans five floors underground. It is this magical cellar that takes your breath away and makes you feel how connected Zidarich wine is to the winery’s roots, his family and the region. Benjamin took over the winery from his father in the 1990’s and expanded the vineyard and wine making techniques, with an organic approach to farming and cultivating the grapes. He masterfully developed his vineyard and rich wines to incorporate the surrounding landscape. Before returning back to Trieste during our getaway, we took a 10 minute drive to visit the charming seaside village of Duino and see its’ castle, Castello di Duino. 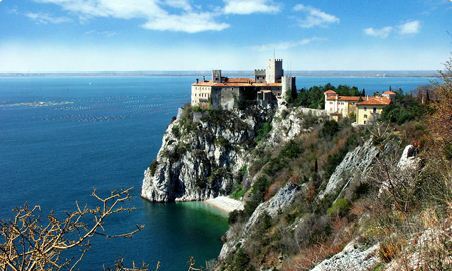 The castle stands on a karst rock cliff with a stunning view overlooking the Gulf of Trieste. The older castle remains are still standing down below the newer castle above that was built in 1389 and first inhabited by the Wallsee family. Today, the property is owned by Prince Carlo Alessandro della Torre e Tasso, from the Czech royal branch of the House of Thurn and Taxis. For more details the history of this castle, visit their website.